Hip Replacement Surgeries have become common around the world. Weakened bones and joints as we age restrict movement and make it difficult to even sit. Hip replacement procedures give those individuals another shot at enjoying life pain free. Accidents and other disorders might also result in a person needing a hip replacement surgery. While the surgery takes just a few hours, the recovery could take not just days but months. The recovery from this type of surgery is not just painful but at times even frustrating. Especially for those especially independent people who are used to taking care of themselves and do not like being dependent on someone to move. Necessity is the mother of invention and thus in today’s world there are a plethora of products available that can be helpful in giving proper home care after hip replacement surgery. These types of devices and tools help a person get through the tough time of coping with a slow and painful recovery from hip replacement surgery. Beyond the recovery period, some of these hip replacement aids enable a person to carry out basic day-to-day house chores without the support of someone else. This makes them independent and confident, thus somewhat helping with the healing process. Moving around in the bathroom can be a difficult task. Transfer benches or shower benches are specifically designed for a person to easily move to and fro from a bathtub or a shower area. The design is based on simple mechanics and helps a person move without exerting pressure or strain on their hip. This post hip surgery equipment can be placed permanently inside the bathroom and can also be removed if necessary. After the hip replacement surgery, one is not recommended to exert stress or strain on the hip. Continuous sitting and standing while in the bathroom might cause pain and discomfort. Transfer benches can ease this discomfort. Moving inside or outside the bathtub or using the toilet involves the risks of slipping and falling. Transfer benches and chairs reduce these risks drastically as a person no longer has to manually move from one position to another in the bathroom. There are two types of transfer benches, sliding benches and non-sliding benches. The non-sliding ones are usually like a chair and have a backrest. They are lightweight and have handles so that a person can be lifted and placed into the desired position. They can be easily carried around in the bathroom. The sliding ones are usually fixed in one place but are easier to use than their counterpart. An individual comfortably sits on the bench or the chair and another person slides the seat into the desired position. The padded seating of the chair is comfortable for the user and provides a cushioning support to the buttocks. 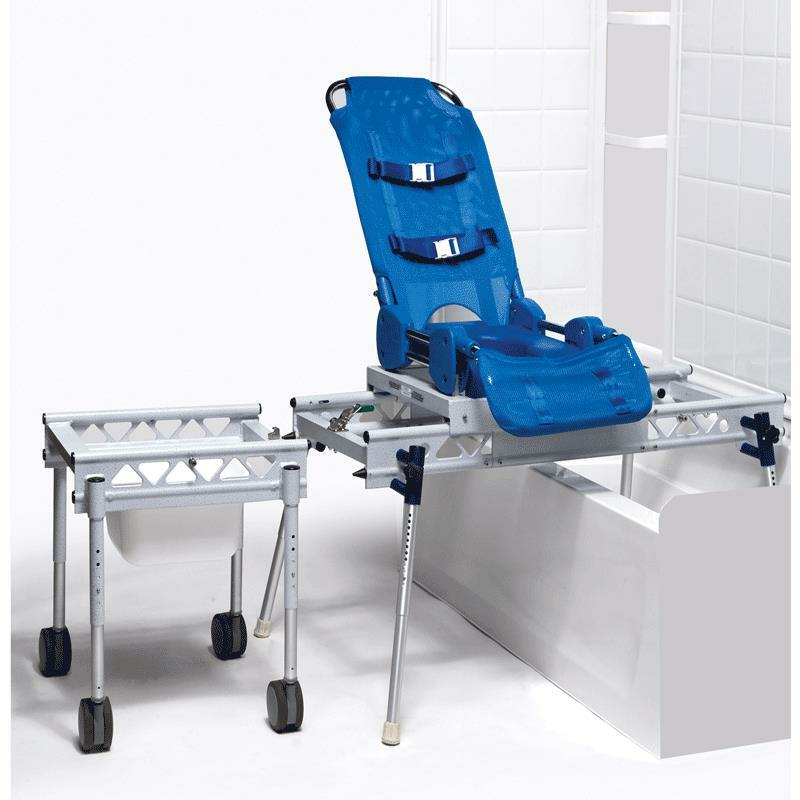 The chair can be separated in most cases from the track functioning, thus making it easier for the person to move out of the bathroom on the chair itself. It can be used in almost all places in the bathroom including the bathtub, commode, or the shower area. 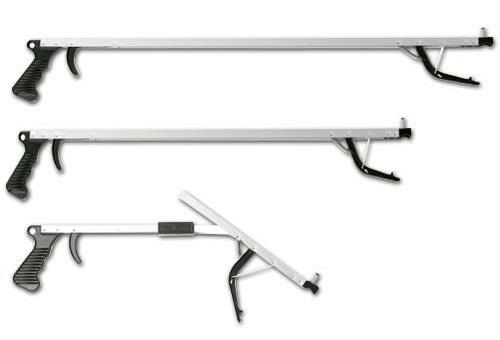 The locking system on the rails ensures the maximum safety for the user. They come in bariatric variants as well, thus allowing everyone to use them. You can choose benches that come in fixed heights and adjustable heights. Many of the benches have suctions cups on the legs that increase stability. Accidents, physical disabilities, or neurological issues might at one time impair the use of a person’s hand. A hip replacement surgery may leave a person unable to have a full range of physical movements for a small period of time. This causes a lot of difficulty in completing even the most basic of household chores. Picking up, pushing or pulling things, and even holding something firmly becomes a major issue. This is where reachers come into play. They use a simple pulley like mechanism to help a person pull, push, hold, or pick things up. One can consider them to be an extension of the arm. A simple tug or pull to the handle engages a lever which in turn moves the arm at the extended end, thus putting the reacher in motion. There are six basic types of reachers such as all-purpose, ergonomic, folding, adjustable length, lightweight, and outdoor reachers. They are classified based on the structure and varying features of each reacher. They reduce the need for extending or stressing the arm or the hand. The brightly coloured claw and handle allow it to be seen easily. The claw is made of slip resistant material to avoid accidents. The handle is ergonomic and responds to a gentle push or pull of the lever. They are usually lightweight and can be carried around easily. They can be attached to wheelchairs or benches so that they're readily available. They can be folded and stored easily. Shower sprays are something that people mostly have in every home around the world but the ones used for rehabilitation are different from the ones we use at our homes on a daily basis. The functioning is the same as common shower sprays but the structure is specifically designed for people adapting to repercussions of decreased hand strength and grip, injuries, etc. After a hip replacement surgery, it is critical that a person be careful in the bathroom, as there are high chances of being injured. These shower sprays are specially crafted to ensure a person bathes without any difficulty of gripping or moving around much. They allow a person the freedom to bathe independently and thus ensuring the privacy of the activity. One can easily attach the shower spray in almost every bathroom type. There are four types of shower heads: adjustable, hand-held, fixed, and portable. 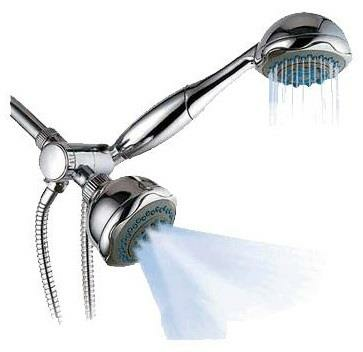 Adjustable shower heads can be removed and attached to shower sprayers. 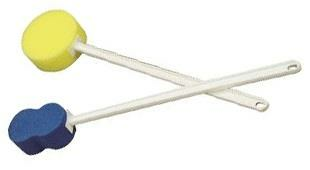 Hand-held shower heads increase the range of use, allowing a person to use it while sitting. Fixed shower heads are usually recommended for people who sit to bathe in the bathtub. Portable shower heads are sliding shower heads that can be moved around while attached to the wall. They can be attached to the wall or used while moving around in the bathroom. They can be connected to a hose and used as hand-held shower sprayer. Many of them have a detachable shower head and can be used as both fixed and portable. They reduce the need of a third person while bathing. They have a massaging head that can be used to sooth the pain in some regions of the body. Bending down or even entering a seated position quickly is not recommended for people who have undergone hip replacement surgeries. Toilet seats after hip surgery can be considered low for people who have difficulties in sitting down in that position. Therefore, you can use toilet seat risers to increase the toilet seat height after hip replacement surgery. They allow a person to easily use the toilet. They increase the height of the commode thus ensuring that the person doesn’t have to bend down or sit in an uncomfortable position. They are available with or without armrests. They also have a detachable lid. Hinged – They have hinges at the rear portion of the seat to allow other people to use the toilet without using the riser. It can be lifted and placed back again when needed. Elongated – They are wider at the base and have enough space to give comfortable seating to the user. Basic Risers – They are simple in design and only serve the basic function of raising the toilet seat. They are mostly made of plastic that is skin friendly and water-proof. No assembly is required for seat raisers as they are one unit. 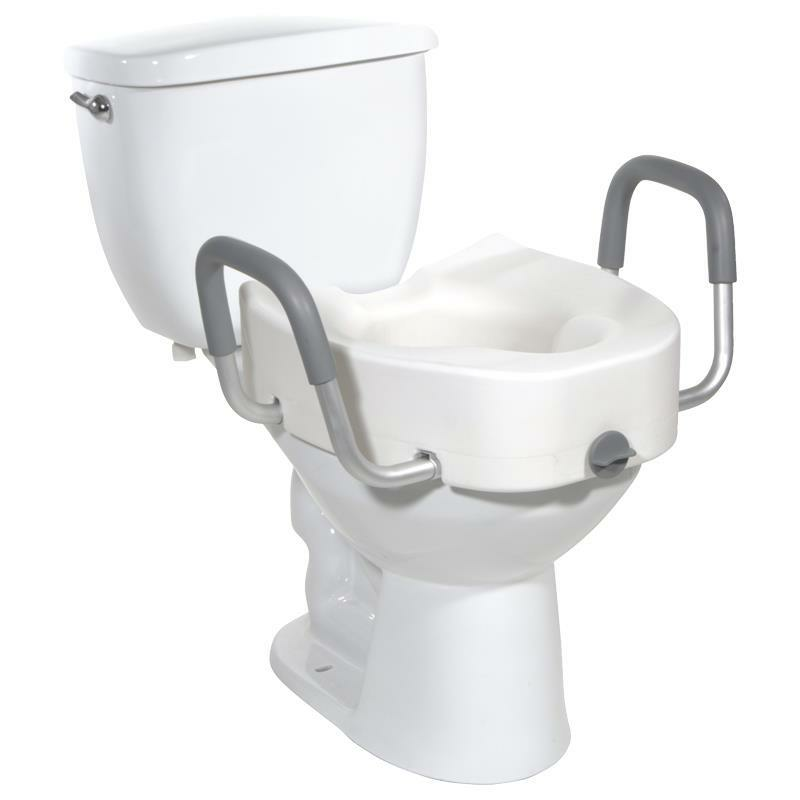 They can be easily fixed over all types of commodes and are smooth to fix and use. They come in variants that are high and can support almost all body weights. They include armrests that can be detached. These armrests provide additional support. They have screws or other locking systems that ensure the safety of the user. They can be cleaned easily with soap and water to ensure hygiene. Dressing requires a number of activities coming together which include, standing up, sitting, bending, and moving the legs and arms in different positions. All these can be difficult for a person who has just gone through a hip replacement surgery. A number of dressing aids can help people easily dress without having to go through a lot of difficulty or pain. There are a number of things one must put on before starting the day and even more if one needs to go outdoors. From shoes to socks, from buttoning a shirt to tying the shoelaces, almost all the activities require complex movements of sitting down, standing or using the arms and legs in a continuous motion, all of which might be difficult for someone who has gone through a hip replacement surgery. Shoelaces and Fasteners – Elastic shoelaces are used by almost all those who have difficulty bending down to or even just the simple act of tying shoelaces. Dressing Sticks – They come in various structural types and features and include sticks that help in putting on and adjusting clothes and undergarments. Hair Grooming Aids – They include brushes, combs, elastic bands etc, which can be used in different ways with different features to reduce discomfort or pain during use. Zippers and Button Aids – Buttoning a shirt can be difficult during times when the arm doesn’t have enough strength to perform this activity. Button aids help in relieving this situation. Zippers can also be attached to help. Shoe Horns – One can easily just slip their leg in the shoe while a shoe horn is clipped or placed inside the shoe. It then easily slides out without any discomfort. Hip Kits – Hip replacement recovery kits are equipped with almost all kinds of dressing aids in one. From simple reachers to bathing aids and other important aids, hip kits are specifically designed to aid people during the rehabilitation phase of hip replacement surgeries. Getting out of the bathtub or getting up from the commode might require assistance for many people who have gone through a hip replacement surgery. A person would always prefer privacy in such situations which requires one to be independent. Grab bars and rails attached to the wall in the bathroom can help a person achieve this independence and privacy. 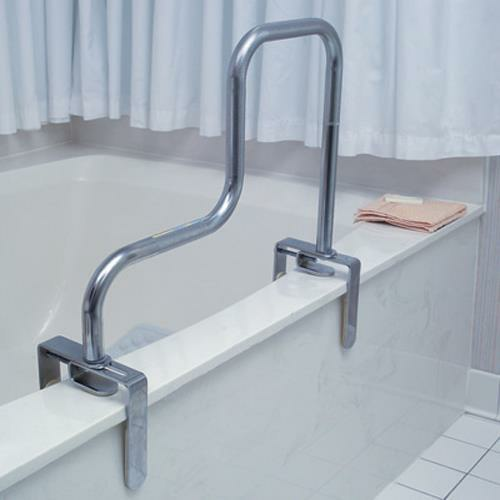 Made of either rubber or stainless steel, these grab bars or rails can be easily attached over the rim of the bathtub, beside the toilet, even on the walls of the bathroom. Holding the grab bar while bathing or using the toilet allows a person to maintain stability and reduces the risk of falling. Maintaining balance in the bathroom is important as slipping or falling in the bathroom can result in serious injuries. This is especially true of people who have undergone hip replacement surgeries. There are six types of grab bars: wall grab bars, tub grab bars, suction cup grab bars, knurled grab bars, curved grab bars, security poles. Also there are four types of safety rails viz., tub safety rails, toilet safety rails, toilet safety frames, and shower support rails. They help maintain balance and reduce the chances of slipping or falling in the bathroom. They can be easily attached to the walls of the bathroom at different angles and positions. Grab poles reach from the floor to the ceiling and their special features enhance the experience by providing comfort and safety. They are perfect for people with limited mobility or limited range of motion due to major surgeries. They are cheap, easy to install and one of the easiest ways to ensure patient safety. One of the oldest support systems for mobility in history, canes in today’s time have grown with the advent of technology. From being chopped or broken pieces of wood in the ancient past to highly durable and strong ones today, canes have come a far way. Hip replacement surgeries might often leave you with decreased strength of the thigh and buttock muscles, thus causing pain or discomfort while standing, getting up, or walking. One of the most convenient and safe options are canes. 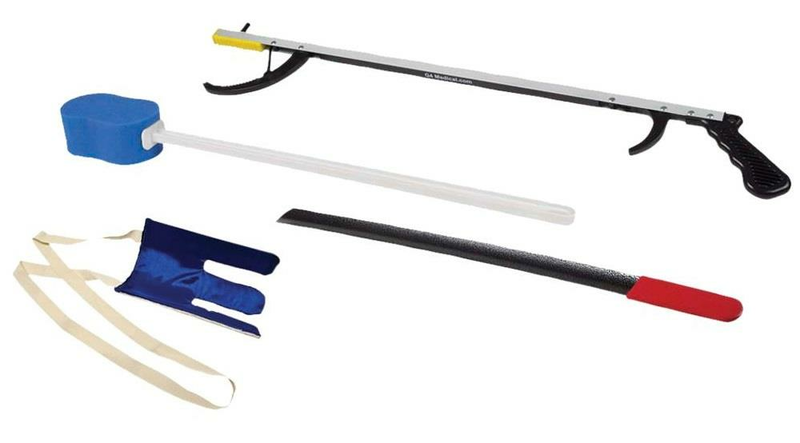 Various types of canes such as wooden, steel, quad-canes, travel canes, etc., give the person the liberty to make choices according to their needs. Installing grab bars and poles everywhere around the house isn’t a feasible option and so people who have difficulty while standing up or sitting down without a strong support are recommended to use canes. Even while walking, one requires strength as stress is exerted on the legs as well as the hip and abdomen. To reduce this strain canes are used that absorb the strain and help in maintaining balance. Help in maintaining balance while walking, standing, or sitting down. Reduction of stress on the legs, thigh, abdomen, and hip muscles. They are made with strong and durable material to ensure the longevity of the cane. Ergonomic handles allow for easy usage and firm grip. They reduce the chances of falling or tripping while walking or standing up. Many a time, they are equipped with wheels to increase mobility. Hip replacement surgery renders the patients temporarily incapable of doing basic physical motions like bending over. This temporary handicap can result in difficulties in completing all the activities that encompass bathing independently. Bath accessories like these long-handled sponges replace the human dependency factor allowing a person to be independent and have privacy while bathing. Their long handles give the person enough range to scrub between the toes without bending over and to clean their back and other hard to reach regions of the body. These hip replacement recovery tools have been a boon for people who have gone through a hip replacement surgery or will be going through one soon. The rehabilitation or recovery period of most major surgeries can be difficult at times. These items after hip replacement help a person get through this time as independently and comfortably as possible.